Sign up for a walk with Camille ! 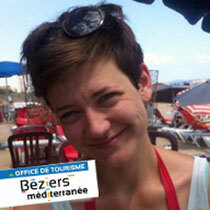 - Béziers Méditerranée Greeters, un autre tourisme ! Sign up for a walk with Camille ! Camille loves being outisde, and most of all being outisde for a hike, a run, or a ride! Come and discover unexpected paths around Valras-Plage, Sérignan and the Canal du Midi, you will spend a peaceful moment in a quiet and natural environment ! Camille can take you for a walk from Valras-Plage to Sérignan, a hike along the Canal du Midi, or take a bicycle and follow her from the beach to the Canal! Breath! Summer is here! !